Should a zombie apocalypse strike, I assume Boyfriend and I would flee the city to campout in some forest or rural village. While I would like to think that we would take Kitten with us, the truth is, he would probably slow us down. Being alone, Kitten would need to find his own food. While this might not be a problem for most cats, I guarantee it would be for Kitten. First of all, Kitten has trouble eating from his food dish on a normal day. His face is just the wrong shape. It is very difficult for him to get his flat face into a dish that is not flat. You think Boyfriend and I would get him a dish more conducive to his face shape, but we find we are better able to maintain his weight this way (that was a joke, we are actually just too lazy). 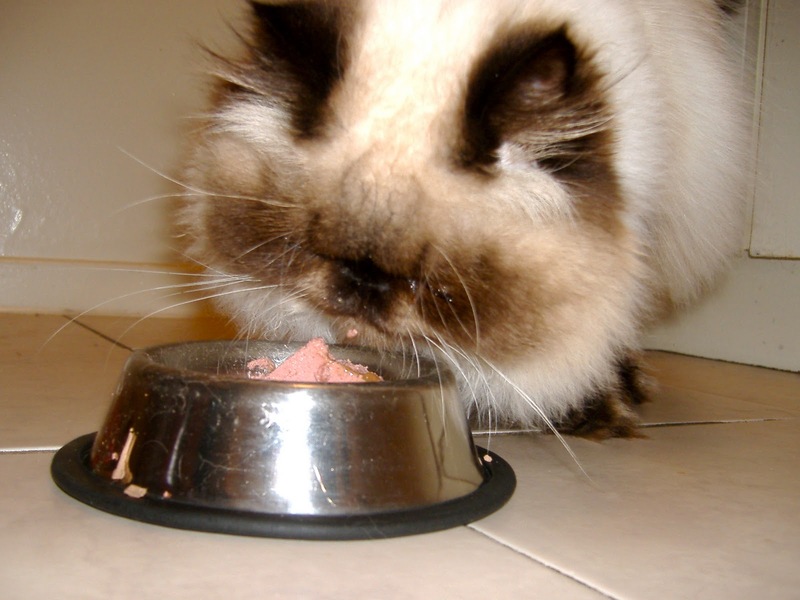 Secondly, Kitten is very picky about what he eats. He likes cheese, pizza, soup, and Nibs. These things are not readily available to cats without the assistance of a loving owner. Basically Kitten would starve. For the longest time I wondered why Kitten never got hairballs like other cats, especially considering the amount of fur he has. Eventually, I realized it was because he never actually cleans himself. Anytime Boyfriend and I go away for a long-weekend, we always return home to a matted, greasy disaster. Kitten needs to be brushed constantly and also needs to be bathed to compensate for his own self-neglect. I honestly believe that Kitten would develop some fungal infection, or something along that line, within a week of being left alone. Kitten also has this thing where he gets very goopy eyes. He needs to have his eyes wipe by me or Boyfriend a minimum of once a day. I think before the fungal infection ever even got to him, his eyes would goop over completely and blind him. I understand that most cats like to nap; I mean they do have their own saying about it. But Kitten, he doesn’t even nap. He just lies in various places around the apartment in whatever position he happened to fall in. You can nudge him, and push him, and “gently” kick him all you like, but he won’t budge. I am pretty certain that Kitten would prefer to let Zombies trip over him instead of actually moving. He would be dirty and hungry, but he would just lie there waiting for food to come to him. It wouldn’t. You know how when you play hide-and-seek with really small children they can’t grasp the concept that even though they can’t see you, you can still see them? Let’s just say that Kitten and two year olds have more than just bad hygiene in common. There is no possible way that Kitten would be able to successfully hide himself from predators, and by predators I mean the billion dogs that live in my apartment and will have formed a hunting pack within the first week of the apocalypse, undoubtedly led by the small wiener dog on the first floor. Okay, Boyfriend and I are the only things that have tried to eat Kitten. I mean I can’t vouch for the vet, but I am pretty sure the vet has not tried to eat Kitten. However, I still feel that this is a major evolutionary flaw that could be the ultimate downfall of Kitten.